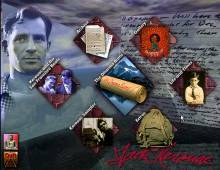 Jack Kerouac, icon of the Beat Generation, novelist and poet, is one of the most influential writers of the twentieth-century. Not surprisingly, his thoughts have had a growing impact on today's Generation X (of which yours truly is a member). For those looking for more insight on this influential writer and fellow Beats who surrounded him, A Jack Kerouac Romnibus is a perfect reference. Published by Penguin Electronic, the short-lived multimedia publishing division of UK-based giant Penguin, this excellent CD-ROM includes the complete text of Kerouac's third novel The Dharma Bums as well as almost two hours worth of rarely seen videos of Kerouac himself and Beat critics. The Dharma Bums, the centerpiece of the CD-ROM, is a fine early example of how to enhance a novel with multimedia elements. Each page of the text is full of hyperlinks to textual anecdotes and glossary, as well as audio and video clips (including the rarely seen video clips fo Kerouac himself -- which I unfortunately had to exclude from this download due to large size). The novel, my second most favorite Kerouac novel after On The Road, is a complex, gripping story of two friends and their struggles. Perhaps more than any other Kerouac novel, The Dharma Bums explores Buddhist concepts and the role of religion in the Beats' universe. Since one of the protagonists is a Zen Buddhist and the other a Theravadha Buddhist, readers will also get a very interesting, even educational insights into the two main sects of Buddhism. Although the CD-ROM would have already made it into our Hall of Belated Fame with just the annotated The Dharma Bums alone, A Jack Kerouac Romnibus includes many "extras" that are all fun to read and very interesting. The "Jack and The San Francisco Beats" feature, for example, is a family tree linking romances, mentor relationships, breakups and cohabitation among key Beat figures. "Life and Times" is a comprehensive timeline with a year-by-year breakdown of events in Jack Kerouac's life, from his birth in Massachusetts to his death in Florida. "The Gallery" contains original, never-before-published artwork by Kerouac himself and snapshots by member of his circle. Last but not least, "The Archive" features memorabilia from the Kerouac estate including transcripts from Kerouac's journals and personal artifacts including the famous backpack he use when travel from coast to coast the scenic way. You can even read transcripts of the notebooks if you can't make out Kerouac's handwriting. A Jack Kerouac Romnibus, which brings together the talents of writer Ralph Lombreglia, documentary film maker Kate Bernhardt and the Kerouac estate, is an incredible resource for the Kerouac fan and student. In addition to fully annotated The Dharma Bums, dozens of letters, journal writings, diary pages, and snapshots give a rare glimpse at the man behind the words. Highly recommended not just for Kerouac fans, but for anyone interested in reading one of the best novels ever written. A Jack Kerouac Romnibus is undoubtedly one of the best reference CD-ROMs ever produced, and a must-have. If you are interested in learning more about the Beats, check out Voyager's The Beat Experience CD-ROM, a more superficial but more stylish CD, as well as other related links below.